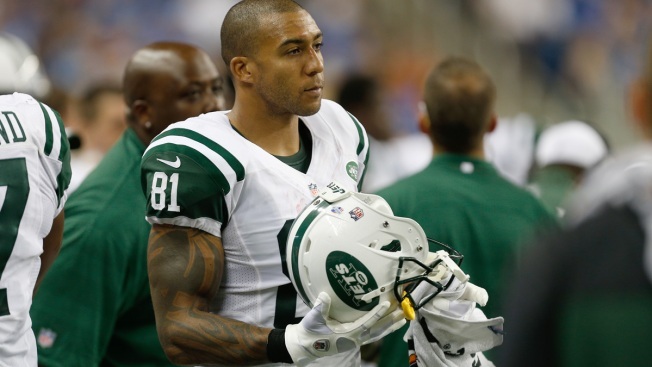 Kellen Winslow might return even healthier after the bye week plus serving four-game suspension for banned substances. A bye week in the National Football League is both a gift and a curse. With the Jets not due to play for another 11 days, the free time gives them the opportunity to rest but it also provides the mind with a chance to wander. When Gang Green travels to Buffalo to take on the Bills on November 17, they'll likely be getting a lot of useful parts back. The season can wreak havoc on a team's health and a bye week later in the year can be incredibly helpful in giving the roster a chance to recover and heal. The Jets abandoned the passing game with a heavy focus on the rushing attack for much of the day in last Sunday's upset win over the New Orleans Saints, and it's a good thing since they were without their top two tight ends. Kellen Winslow and Jeff Cumberland were forced to sit out due to suspension and a concussion, respectively, but the two should be ready to go in Buffalo. Winslow last played a month ago after being served with a four-game ban as a result of violating the league's performance-enhancing drug policy. Winslow was second on the team in receptions before getting suspended and could be as healthy as he's been in years when he takes the field. He deals with chronic knee pain thanks to multiple surgeries and the bye week combined with time off via suspension could be just what the doctor ordered. While the recovery time for a concussion can be tough to predict, it's likely that Cumberland, along with safety Antonio Allen, who is also sidelined with a concussion, should be cleared to play in a week and a half. Receiver Santonio Holmes hasn't appeared in a game since September 29 while dealing with a hamstring injury and it's very likely he'll be in the lineup when the Jets resume play. The team ranks near the bottom of the league in most passing categories and needs as many weapons as possible. Holmes wasn't great by any means in four games but the Jets sorely lack any sort of veteran presence from their receiving unit. Whenever he returns, it would be ideal if Holmes acted like a veteran rather than a child. He made waves earlier in the season by complaining about the lack of balls being thrown in his direction and whined that he couldn't throw it to himself. He's had flare-ups with behavioral issues in the past so if Holmes plans on causing a stink upon his return, the team might be better off if he stays home. Jeremy Kerley, who dislocated his elbow Sunday, will still be out for a few more weeks but the time off means he'll have to miss one less game. Unfortunately, the bye week also means fans and the media will be able to cook up more juicy storylines and unwanted distractions for the team. Head coach Rex Ryan has done a terrific job leading this team but any talks of extending his contract are extremely premature. As great as he's been, the Jets don't benefit from locking him into a deal immediately as opposed to at the end of the season. The players appear to enjoy playing for Ryan but there are still seven games left and a lot can happen between now and late December. All things considered, Ryan probably should be invited back next season and beyond but there's no reason that a decision has to be made today or any time soon. On the same token, let's let the season play out before we start discussing possible playoff matchups for the Jets and whether it's possible they could be the first team to play at home in the Super Bowl. Given how horrible this season was supposed to go, it's wonderful the Jets are in this position and that the passionate fanbase is able to discuss potential playoff seeding rather than how high the team's draft pick will be. But raising expectations now is only going to bring on more venom and disappointment if things don't go as planned. It's one thing to be positive but, when a team can't even win two games in a row, it's another to be overly optimistic. Time off should always be considered a good thing. It's a chance to relax and recharge your batteries and that's especially invaluable in a grueling sport like football. There's no need to think about who the team's opponent might be in January or who will be coaching the Jets next September. As cliché as it might sound, there's a reason most coaches preach to their players to take things one game at a time. If the team wants to make the playoffs and wants Ryan to return next season, a good start would be resting up and worrying about the now.